Submitted by Amanda Ruland on 6 April 2019. The Trans-Alaska Pipeline System (TAPS) is one of the largest pipelines in the world. This behemoth spans 800 miles across the Alaskan terrain, from Prudhoe Bay to the Valdez Marine Terminal. Crossing three mountain ranges, three major earthquake faults and over 500 rivers and streams, the pipeline transports approximately 226,174,050 barrels of oil each year, 10% of the United States’ oil production. Thawing permafrost and unstable ground soil could result in devastating consequences for over 400 miles of the pipeline. To help alleviate this threat the pipe is insulated and elevated above the ground in permafrost zones. The exposed sections of the pipeline are constructed in zig-zag patterns to allow for expansion and contraction as air temperatures change. Another safeguard involves special “heat pipes” containing pressurized ammonia and gases that work like a refrigeration system. When the outer air is cooler than the ground, heat passively transfers from the ground to the air, making certain frozen ground remains frozen, and the pipeline remains stable. In short, many precautions have been taken to ensure that permafrost continues to support the pipeline. It is essential to its stability. Yet, the use of oil contributes to the melting of permafrost, and it is melting at rates never seen before. 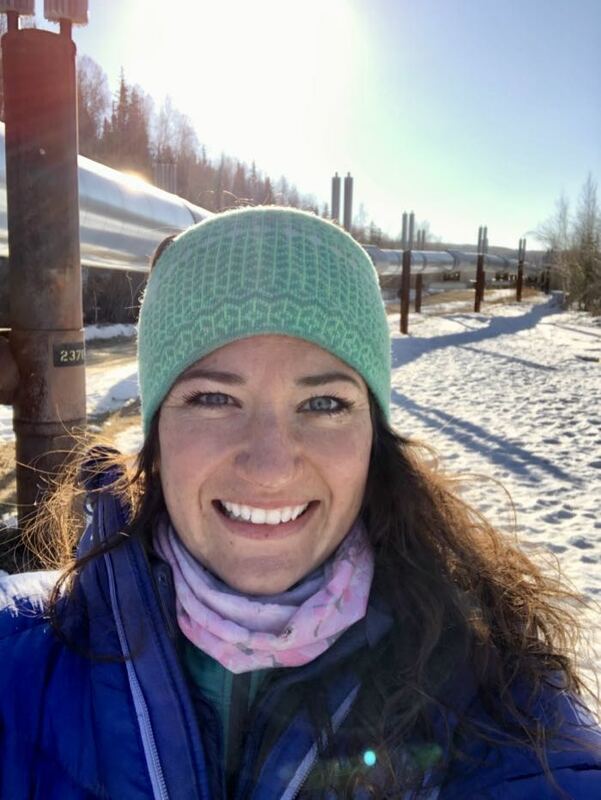 Amanda Ruland stands under the Alaska Pipeline in Fairbanks, Alaska. 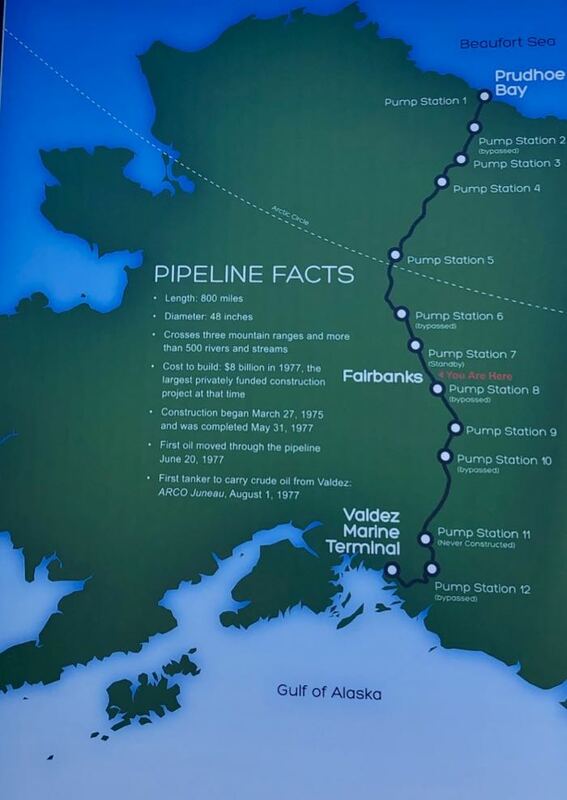 The Alaska Pipeline's 12 pumps run from Prudhoe Bay to Valdez Marine Terminal. 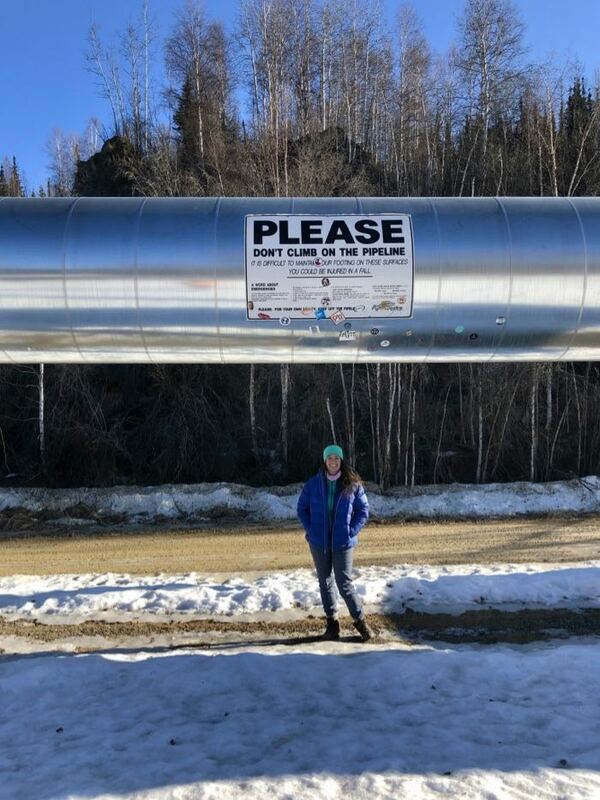 Amanda Ruland stands in front of the Alaska Pipeline.